Dating and humor. It can be a winning combination for those looking for love online, and lethal for those who suffer from a texting anxiety complex. First we saw the single girl with the cat video which spread across the Internet. We laughed, we shared it, and we really didn’t want to be that girl. Then we found out about Ashton Kutcher’s online dating video, which was a spoof. Most of us remember spreadsheet guy, who was totally embarrassed that his date and her friends leaked his private excel spreadsheet with comments about each date to the media. But the saddest of them all are those who suffer from the crazy texting syndrome. Both men and women are not immune from this new epidemic. 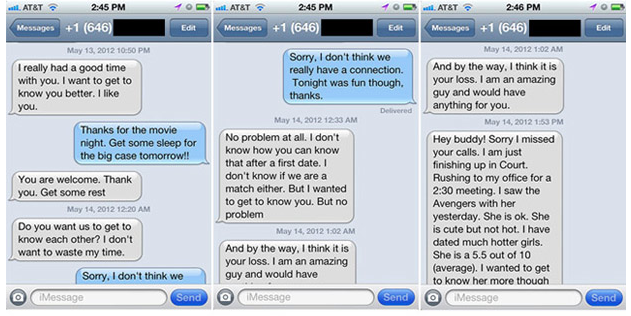 A few stories have been spreading online with screen shots of text messages that will make you cringe. Yes, both men and women get obsessed with sending breakup texts or ones begging their dates to see them again. Those desperate to love and be loved sometimes can?t always control their digital fingers. They call, they text, they email, they beg, become control freaks, breakup, and in the end they make complete fools of themselves for the rest of the world to see. Even if he or she might be interested in a second date or reconciliation, this behavior chases them away in a New York minute. Gawker reported on the Fedora Lawyer guy in New York who went to the movies to see The Avengers with a movie date who needed to keep the upper digital hand. His date wasn’t that into him, but she behaved properly on the date, didn’t insult him and let him know she had a nice time, but he wasn’t for her. This is more typical than not, as most singles don’t get to a second date. The Fedora was described as passive-aggressive. He decided to rate his date a 5.5 out of 10 and put her down saying it was her loss. A few months ago, BuzzFeed shared the story of the girl who slept with the guy on a first date. She subsequently sent over 50 messages in 3 days, both begging him to see her and getting angry with him. All they had was one date. Now she has a permanent digital footprint on the Internet of a drama she probably wished she hadn’t been a participant on. The point is that we all want to feel love and be loved so badly, that sometimes we act in desperate ways to connect which results in sabotaging any potential with your new crush. Sure we can make fun of these stories. When I wrote The Perils of Cyber-Dating, I wanted to share some humor about my own personal stories that I believed others could relate to. But there comes a time where you need to take the high road, hold your head up and have some dignity and just walk away when it’s over. Dating is a numbers game. Instant chemistry is rare. When you find it, don’t take it for granted. Don’t play texting games or try to manipulate someone to like you or see you again if the feelings aren’t mutual. Let the relationship move at a healthy course and keep the communications open. If someone politely says they’re busy and can’t get together again, don’t let it become an interrogation or deposition. You don?t want to go down in history as being that crazy guy or girl that no one will want to go out with again. At the end of the digital day, think before you text. Anything you send digitally can and will be shared. There’s always someone else who will find you to be an incredible addition to his or her life. Sometimes the best things in life are worth waiting for. Don’t Become a Digital Dating Fool while Dating in a Web 2.0 World. Julie Spira is an online dating expert and cyber-relations expert. She’s the author of The Perils of Cyber-Dating and The Rules of Netiquette. Connect with Julie on Facebook and Twitter. Join in the conversation on the pages for The Rules of Netiquette and Cyber-Dating Expert and share your online dating stories.